When and why did you first become interested in gymnastics? When I was 3, I was watching gymnastics on TV with my parents. When a commercial came on, I pulled a cushion off of the sofa to use as a mat and decided to try a backhandspring. Unsurprisingly, I fell on my head. I sat up and told my parents that I should probably learn how to do it first and my mom signed me up for classes the next day! Do you have any good/funny memories from when you first started taking gymnastics classes? When I first started taking gymnastics classes, I took everything very literally. The one day, my teacher told me to do a cartwheel off the beam, so I reached for the ground and did a side aerial off the beam! I later learned that a cartwheel off the beam meant to put your hands ON the beam, and cartwheel off. When did you decide you wanted to compete? And, when did you want to compete at a high level? What about competition appeals to you? I was invited to team at age six. I have always loved gymnastics, so I stuck with it and moved up through the levels. I am a very competitive person, so I loved the idea of working to perfect my routines to perform in competition. I like that competing gives me goals to work towards, and it has also been incredible to meet people from across the country and all over the world through competitions. What is your training regimen? Was that a big change when you made the switch to competitive gymnastics? I train about 23 hours per week. With each level I’ve competed at, my training hours have increased gradually so there was never really a big or sudden change. What is your favorite event? My favorite event is beam. What is your favorite skill? My favorite skill is a yurchenko 1.5 on vault. What music do you use for your floor routine? I use a Sherlock BBC mix. Who is your favorite gymnast or who is your “idol”? 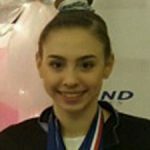 Some of my idols are Nastia Liukin, Dominique Moceanu, and Maggie Nichols. How have you grown as a gymnast during your career, both skill wise and mentally? Throughout my career, I have progressed skill wise on every event each year. Mentally, I have become more focused and learned how to stay motivated and determined. How has gymnastics helped you as a person? Gymnastics has helped me to be strong both physically and mentally, and has taught me countless life lessons. If you had to select one life-lesson that gymnastics has taught you, what would it be? Gymnastics has taught me how to be determined, and persevere no matter what. Everybody has bad days, and it’s important to learn from them and keep moving forward. What are your biggest accomplishments or best memories in your career? I am so lucky to have had the opportunity to compete in the Nastia Liukin Cup previously in 2016 and 2017! After watching Nastia Cup on TV leading up to 2016, it had been a major goal of mine to qualify. Competing there has been such an honor and definitely a highlight of my career to meet that goal. I have also been blessed to compete at several JO Nationals. Through my Regional and National scores, I have made the Region & All-Star team 3 times and competed internationally in England, Germany, and Peru. Going on those trips was absolutely incredible and I am so grateful for all of the opportunities I have had! What grade are you in school? I am a senior. Do you want to compete in collegiate gymnastics? Yes! I will be attending the University of Michigan. GO BLUE! What are your favorite subjects, etc.? My favorite subjects are Spanish and English. If you plan to go to college, do you know what you want to study there? I am still undecided on what I would like to study, but I am considering sports management, psychology, and law. What are your goals for the future, both as an athlete and after you are finished competing? As an athlete, my main goal is to improve as much as I can and to enjoy the process. I aim to contribute to the team at the University of Michigan, and hopefully win a national championship! After I am finished competing, I would like to find a career I am passionate about and be able to give back to my community. When you’re not in the gym, how do you enjoy spending your time? Do you have any hobbies or favorite activities? Charities? When I’m not in the gym, I like to read, bake, and spend time with friends and family. I also volunteer with the Berks County Special Olympics gymnastics program, and I am so grateful to have the opportunity to coach these athletes and watch them progress in their gymnastics as well as create new friendships! What is your favorite food? My favorite foods are pasta, popcorn, and all fruit. What is your favorite movie? My favorite movie is Divergent. What is your favorite book? My favorite book is The Great Gatsby. What is your favorite music singer? My favorite music artists are Selena Gomez, and Khalid. Are any of your family members current or former athletes? Which sports? I have three younger sisters who are all gymnasts. Nicole is a level 10, Nadia is a level 8, and Noelle is a level 7! Do you have any competition rituals? Lucky charms? I have pajamas with frogs on them that I wear to bed the night before the competition, and I also wear the same earrings for every meet. What’s on your IPod right now? What type of music do enjoy listening to? How about before a meet when you’re trying to get focused and pumped up? I normally listen to pop music. Before a meet, I don’t usually listen to music, but if there is any on I’m usually dancing! If you had to pick 3 words to describe yourself as a gymnast, what are they? I would describe myself as passionate, confident, and determined. A: I had too much energy when I was little. When I was three years old, I jumped off the sofa and tried to do a back handspring all by myself (and landed on my head!). My mom signed me up for gymnastics the next day. A: I just remember being really excited to go to class every week and to learn new skills. A: I train 22 hours a week. A: Nastia Liukin, Dominique Moceanu, Aly Raisman, and Simone Biles. A: Gymnastics has taught me to work hard for my goals and that if I want to accomplish something, I need to be the one to make it happen. A: I am in 11th grade at 21st Century Cyber Charter School. A: I will compete for the University of Michigan when I graduate. Go Blue!!! A: I like Math and English. A: My goals for the future as an athlete are to continue to push myself to be the best gymnast that I can be. After I am finished competing, I hope to move on to a career that makes me happy and to stay involved in the sport by coaching or judging. A: When I’m not in the gym, I like to read, bake, shop, and spend time with my family and friends. I also am a volunteer coach for the Berks County Special Olympics Gymnastics Team, and I love working with all of the Special Olympic athletes. A: I like Selena Gomez and Taylor Swift. A: All three of my sisters are competitive gymnasts. A: I wear my frog pajamas the night before every competition and visualize my routines before I fall asleep. A: Passionate, confident, and determined. 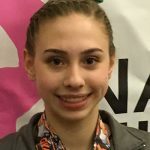 Natalie Ann Wojcik, 16, Douglassville, Pa. I live at home about 20 minutes from my gym. When I was 3, I was watching gymnastics on TV with my parents and was so excited to try what I saw. When a commercial came on, I stood up and tried to throw myself backwards in the air to do a back handspring and landed right on my head. After that I stood up and told my mom, “I think I better learn how to do that first!” My mom started calling gyms the next day and signed me up for a trial class. When I first started gymnastics, I tried to do everything exactly the way the coaches told me. One time my coach told me to do a cartwheel off the end of the balance beam, so I went to the end and reached with my arms toward the ground, and did an aerial off the end of the beam right to my face. I then jumped up and yelled, “I’m fine!” and went on to the next beam. When I was on pre-team, I looked up to all the team girls and couldn’t wait to begin competing. What appeals to me most about competing is being able to perform my routines in front of an audience and for the judges. I also really love being with my team and cheering for them. I train five days a week, about three and a half hours each day. 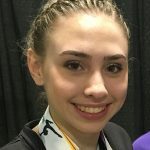 The change was mostly gradual as I moved up from the pre-team levels to competitive gymnastics, so it wasn’t a very big change. 8. What is your favorite event? My favorite event is beam. 9. What is your favorite skill? My favorite skill is a front handspring front double full punch front pike on floor. 10. What music do you use for your floor routine? I use an arrangement of Assassin’s Tango. I admire so many gymnasts, but some of my favorites are Dominique Moceanu, Nastia Liukin, and Simone Biles. Gymnastics has helped me learn confidence and motivation. 13. If you had to select one life lesson that gymnastics has taught you, what would it be? Gymnastics has taught me perseverance. It keeps me motivated to never give up and keep pushing forward until I accomplish what I am working on. This holds true inside and outside of the gym for me. 14. What grade are you in and where do you go to school? I am in 10th grade at 21st Century Cyber Charter School. 15. Do you want to compete in collegiate gymnastics? Yes, I am verbally committed to The University of Michigan, and I am excited to attend there and compete for them in 2018! 16. What are your favorite subjects? My favorite subjects are English and Math. 17. What do you want to study in college? I am interested in pursuing Elementary Education, so that is something I might study in college. My goals for the future as an athlete are to continue to push myself to be the best gymnast that I can be. After I am finished competing, I hope to move on to a career in life that makes me happy and also to continue my involvement in the sport of gymnastics by coaching. 19. When you are not in the gym, how do you spend your time? Hobbies or favorite activities? When I am not in the gym, I love to read, shop, bake, cook, and spend time with my family and friends. I also volunteer coach for the Berks County Special Olympics gymnastics team, and I really enjoy working with all of the athletes. My favorite food is Fettuccine Alfredo. My favorite movie is Divergent. 23. Do you have any competition rituals? Lucky charms? I wear these pajamas with little frogs on them the night before a meet and visualize my routines before I go to sleep. 24. If you had to pick three words to describe yourself as a gymnast, what would they be? 25. If you had to pick three words to describe yourself not as a gymnast, what would they be?